Nearly 40% of the 2015 Inglis Classic Yearling Sale Summer Book is made up of progeny by first and second season sires, a huge positive for buyers given Classic’s phenomenal record of unearthing Group 1 winners by young unproven stallions. 18 stallions since 2000 have had Group 1 winning progeny from their first or second crops graduate from the Inglis Classic Sale, including subsequent top sires Redoute’s Choice, More Than Ready, Dubawi, Street Cry, Danehill Dancer and I Am Invincible. Classic provided buyers access to the aforementioned sires before their progeny rose to great heights on the racetrack, which was swiftly followed by service fee rises and consistent six figure yearlings that proven sires demand. “Inglis Classic is not only Australia’s most accessible sale but one of the most successful with no less than seven individual Group 1 winners purchased from Classic in one year, including two international champions,” points out Mark Webster, Inglis’ Managing Director. In many cases Classic graduates are the best of their sire’s Australian bred progeny, as is the case for Brazen Beau (I Am Invincible), Peggy Jean (Myboycharlie), Secret Admirer (Dubawi), Pressday (Domesday), Macedon Lady (Filante), Fiveandahalfstar (Hotel Grand), Manawanui (Oratorio), Triple Honour (Honours List), Whobegotyou (Street Cry), Royal Purler (Hector Protector), Ike’s Dream (King Of Kings), In Top Swing (Beautiful Crown) and Choisir (Danehill Dancer). $70,000 yearling buy Brazen Beau is expected to venture to England later this year in an attempt cut a swathe through Royal Ascot just as fellow Inglis Classic graduate Choisir did in 2003 claiming the King’s Stand Stakes / Golden Jubilee sprint double. From precocious two-year-old and Classic three-year-old events to staying features Australian Group 1 races won by horses purchased from the first or second crops of their sires at Inglis Classic include the Blue Diamond Stakes, Sires’ Produce Stakes, Champagne Stakes, TJ Smith Classic, Golden Rose Stakes, Coolmore Stud Stakes, Flight Stakes, Thousand Guineas, Victoria Derby, Queensland Derby, Lightning Stakes, Queen of the Turf, Myer Classic, Epsom Handicap, Doncaster Handicap, Yalumba Stakes, BMW Stakes, Metropolitan Stakes and Sydney Cup. “Classic has a phenomenal record with young sires and we are rapt to have 255 yearlings catalogued to offer in 2015 by a great collection of first and second season sires to continue the sale’s success,” said Jonathan D’Arcy, Inglis’ National Bloodstock Director. 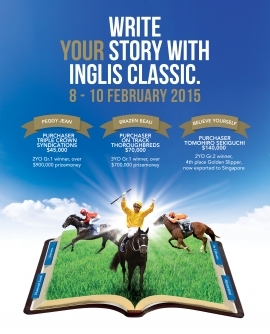 There are 25 first season sires in the 2015 Inglis Classic Summer Book including Dream Ahead (17 lots), Smart Missile (14), Poet’s Voice (13), Pluck (10), Uncle Mo (10), Zoffany (10), Gio Ponti (6), Love Conquers All (6), Foxwedge (5), Master Of Design (5), Shrapnel (5), Toorak Toff (5) and Moshe (4). Each of the first season sires are being highlighted across Inglis’ social media platforms in the lead up to the Classic Summer Book using the hashtag #FirstSeasonSireADay – follow for daily information. Peggy Jean was snapped up by Triple Crown Syndications for $45,000 from the second crop of Myboycharlie at Inglis Classic before going onto Group 1 success at The Championships last year. Second season sires well represented at 2015 Inglis Classic Sale include Star Witness (27 lots), Hinchinbrook (17), Congrats (12), Stryker (8), Rothesay (7), Beneteau (6), Reward For Effort (5), Lope De Vega (3), Per Incanto (3) and Roman Emperor (3).